Now that I am further along in my journey that response really makes me scratch my head and wonder what in the world they are talking about. 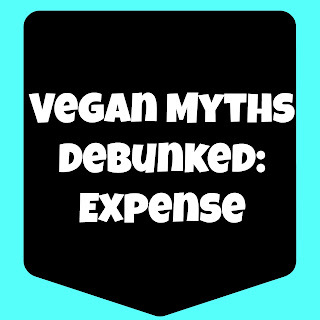 The only logical conclusion I can come up with is if you purchase the processed vegan / vegetarian food (or as I like to call it “Vegan Junk Food”) then it might be more expensive. When I started my journey I purposely tried to avoid those foods. Sure, I would buy them every once and awhile when I am really craving meat. But most of the time, I simply just do not purchase them. In my opinion, these products are for transitioning from a meat based diet to a plant based diet and they are not supposed to be used long term. If you are using them long term, you may want to think about switching. If you look at the ingredients used in them, you are not doing yourself any favors. They are full of preservatives and things that are not the best for you. However, they are a better choice than meat any day. I am not saying that you are wrong if you do use the products, at the end of the day anything is better than eating meat. If you are looking to cut down on the cost then here are a few suggestions I have for you. Use lentils to replace anything that requires hamburger meat. Buying a bag of lentils and much lower in cost than purchasing a bag of Boca. This can be for nachos, tacos, spaghetti or anything you can imagine. Instead of purchasing bean burgers, make them yourself! They can be easily done in a food processor. Buy bagged beans instead of canned beans. Canned beans run about $1 for a can in my area. I can spend the same amount and get a bag of beans and cook them myself. With canned beans you need to also be careful because some companies will use meat products to cook the beans. Buy what is on sale. Buy in bulk, cook it all up and freeze it. One way that I have done this recently is with cranberries. I bought 6 bags when I only needed one and froze the ones that I did not need to use. With some things like Cranberries you do not even need to do anything to them to be ready to freeze them. Do not overlook the produce clearance bin. Most Krogers have a produce clearance bin where they will put older fruit or fruit that fell out of the bags. They rebag them and charge $0.99 per bag. If you have access to things like farmers markets, then you can go towards the end and get an even better deal. Most of the time, the farmers are looking to get rid of what they brought and will be willing to cut you a deal. These are just a few of my go to tips. The ultimate goal here is to work smarter not harder. It is completely possible to eat a healthy, plant-based diet on a budget. What are your favorite tips and tricks? Do you already use some of these? Let me know in the comments below!